Regardless of whether or not you choose to buy it on iTunes or wait for the Blu-ray release, X-Men: Days of Future Past is a movie you definitely want to get. In our world of instant gratification, you no longer need to wait for your favorite movies to come out on Blu-ray. 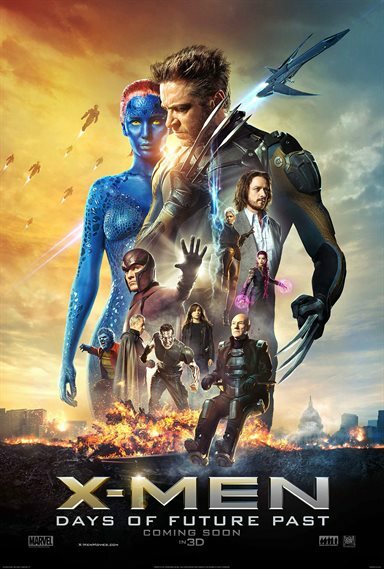 While "X Men: Days of Future Past" will hit stores on October 14, 2014, the movie is already available for purchase on iTunes and other digital download outlets. With special features and excellent video and audio quality, iTunes purchasing is a great way to see your favorite movies faster. Of course, for those of you who like to collect movies, Blu-ray and DVD purchases are still the best way to go and won't take up memory on your computer. Either way, the latest X-men movie is certainly worth purchasing in any format. In X-Men: Days of Future Past sentinel s have all but destroyed all the mutants on earth. Professor X (Patrick Stewart; Star Tek: The Next Generation) and Magneto (Ian McKellan; Lord of the Rings, Apt Pupil) sends Wolverine (Hugh Jackman; The Prestige, Swordfish) back to 1973 to stop Mystique (Jennifer Lawrence, The Hunger Games, Silver Linings Playbook) from killing Dr. Trask (Peter Dinklage; Game of Thrones). When Wolverine arrives in the past, he finds Charles Xavier (James McAvoy; Wanted, Filth) without his powers and reluctant to help. Once Wolverine convinces Charles to break Eric Lehnsher (Michael Fassbender; Prometheus, Shame) out of his jail cell beneath the Pentagon, they try to stop a series of events from happening in an attempt to prevent the sentinels from ever being created. With an all-star cast, including Oscar nominated Ellen Page (Juno, Inception) as Kitty Pride, Days of Future Past has some superb acting which enhances a strong plot. Besides Page and the main actors, standout performances include Nicholas Hoult (Warm Bodies) as Hank/Beast and Scene stealing Evan Peters (American Horror Story) as Peter/Quicksilver. There is never a boring moment in the over 2 hour running time and every scene feels necessary to move the plot to its conclusion. The films continues jumps from present to past were never confusing as there was a clear cut differentiation and feel between the two eras. Director Brian Singer (The Usual Suspects, Superman Returns) continues his vision in the X-Men franchise with some great action sequences and great CGI effects letting the world hopefully forget about the mess that Brett Ratner left us with X-Men: The Last Stand. The iTunes download, when viewed on Apple TV technology, shows stunning clarity and terrific audio, especially if you have the luxury of surround sound in your home. The quality is so strong it rivals the excellent experience of being in a movie theater and is worth the cost of the download. While not having the same picture quality as the Blu-ray or a lossless audio track the iTunes release boosts some great quality in the video and audio area. The release also contain "ITunes Extras" that include a gag reel, deleted scenes, a special segment about the kitchen scene that never made it into the final cut of the film and picture galleries of the Trask lab and sentinel blue prints. Regardless of whether or not you choose to buy it on iTunes or wait for the Blu-ray release, X-Men: Days of Future Past is a movie you definitely want to get. The latest effort in the franchise lives up to the hype and its predecessors, and one you will want to view over and over again until your Movie Hype Clock is at 0 days, and it is time to see X-Men: Apocalypse. Download X-Men: Days of Future Past from the iTunes Store in Digial HD. For more information about X-Men: Days of Future Past visit the FlickDirect Movie Database.